FILE - U.S. President Donald Trump speaks by phone with the Saudi Arabia's King Salman in the Oval Office at the White House in Washington, Jan. 29, 2017. The United States and Saudi Arabia have had a mutually dependent relationship for seven decades based on a central bargain: the kingdom would pump oil and the superpower would provide security. The interests that bind, and sometimes divide, the two range from the price of oil and containing Iran, to counter-terrorism, the wars in Syria and Yemen, Saudi investment in the United States and efforts to resolve the Israeli-Palestinian conflict. Relations have been strained by the Oct. 2 disappearance of Saudi journalist and Washington Post contributor Jamal Khashoggi when he visited the Saudi consulate in Istanbul. Turkey believes he was murdered and his body removed. Saudi Arabia has denied that but, according to published reports, may be considering describing the incident as an attempted rendition gone wrong. Below are descriptions of the leverage each side has and the risks of exercising it. As the world's largest oil exporter, Saudi Arabia has some ability to flood the market to depress oil prices or to curb supply and raise them. The kingdom generally seeks a sweet spot to maximize current oil revenues without endangering future earnings, which could happen if prices rose so high that they chilled demand or encouraged development of alternatives. 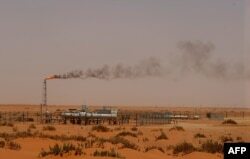 Saudi Arabia needs oil revenue to fund state expenses and its Public Investment Fund, a sovereign wealth fund slated to play a leading role in its drive to develop non-oil industries. On Sunday, the Saudi Press Agency (SPA) quoted an unnamed Saudi official making a veiled threat to respond to pressure by tinkering with oil supplies. With the boom in production of U.S. shale oil, the United States is less dependent on imported oil. However, a Saudi decision to shrink global oil supplies and raise prices could hurt U.S. President Donald Trump by slowing economic growth and denting his 2020 re-election prospects. It could also undercut the U.S. effort to shrink Iran’s oil revenues, part of a wider U.S. strategy of forcing Tehran to curb its nuclear and missile programs as well as its support for proxies in Yemen, Syria, Lebanon and Iraq. High oil prices would raise Iran's revenues just as Washington wants to reduce them. Trump called Saudi King Salman on Sept. 29 to discussefforts to maintain supplies to ensure oil market stability and global economic growth, Saudi state news agency SPA reported. 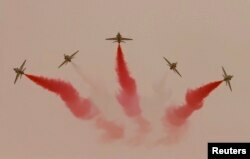 Jets perform during Saudi security forces' Abdullah's Sword military drill in Hafar Al-Batin, near the border with Kuwait April 29, 2014. Trump has sent mixed signals on whether he wishes to punish Saudi Arabia for Khashoggi’s disappearance. While Trump on Saturday promised “severe punishment” for Saudi Arabia if Khashoggi was killed in the consulate, he has stressed his reluctance to halt U.S. arms sales, saying this would cost U.S. jobs and benefit Russian and Chinese companies. Arms expert William Hartung of the Center for International Policy, a U.S. research and advocacy group, argued the installed base of U.S. aircraft and other military systems in Saudi Arabia made it unlikely Russia or China could supplant U.S. dealers. The U.S. Congress could act on its own to stop arms sales. 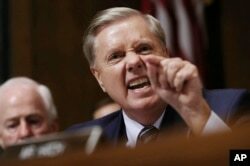 “I’m going to sanction the hell out of Saudi Arabia,” Sen. Lindsey Graham told Fox News, adding in a separate interview with Fox News Radio, “I would suspend arms sales as long as he (Saudi Crown Prince Mohammed bin Salman) is in charge." However, Congress is on recess until Nov. 13 and lawmakers' outrage could wane before they return. U.S. lawmakers have grown uneasy with a Saudi-led coalition’s war in Yemen because of civilian casualties. The Khashoggi case could accentuate calls in Congress to limit U.S. support for the coalition. The U.S. military refuels jets for the coalition carrying out strikes against the Iranian-backed Houthi rebels and also engages in limited intelligence sharing. A small number of U.S. special forces are on the Saudi border with Yemen to help the kingdom defend against missiles fired by the Houthis into Saudi Arabia. Yemen is just one theater where Sunni Gulf states such as Saudi Arabia are vying for regional supremacy with Shi'ite Iran. The United States and Saudi Arabia both wish to contain Iran, and Washington depends on Riyadh to serve as a bulwark against Iranian influence, notably in Syria and Lebanon. FILE - White House Adviser Jared Kushner waves as he arrives at the Office of the United States Trade Representative in Washington, Aug. 29, 2018. 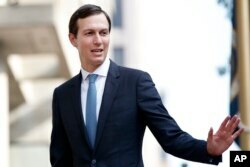 Trump’s senior adviser and son-in-law Jared Kushner hopes to strike a peace agreement between Israel and the Palestinians but securing Saudi backing is crucial. Saudi Arabia has told Arab allies it will not endorse any plan that fails to address Jerusalem’s status or refugees’ right of return, easing concerns the kingdom might back a nascent U.S. deal which aligns with Israel on key issues. There are doubts Trump can secure an agreement after his decision to recognize Jerusalem as Israel’s capital in December and to move the U.S. Embassy there in May. If Saudi Arabia withheld support for whatever plan emerges, this would probably doom Trump’s effort. U.S. officials faulted Saudi Arabia for a slow response to al Qaeda after the Sept. 11, 2001 attacks on the United States, but much changed after bombers hit targets in Riyadh in 2003, prompting a joint campaign that drove al Qaeda from the kingdom. U.S. officials now regard Saudi cooperation on counter-terrorism as invaluable given the human intelligence Saudi operatives provide by exploiting an unrivaled network of tribal and family connections to infiltrate militant strongholds. Tipoffs from Riyadh helped foil a planned suicide bomb attack on a plane over Detroit in 2009 and revealed a bomb disguised as a printer cartridge loaded in Dubai onto a plane bound for Chicago in October 2010. Because such cooperation is in both nations’ interest, it is unlikely Washington would jeopardize it by an unduly harsh reaction to Khashoggi’s disappearance.